It was only today that I was activating an ALDImobile service for a family member that I noted a small red box on the homepage indicating of a change to the unlimited bolt-on. The old unlimited bolt-on is no longer available! Newer is not always better – in this case, for the same price, we are reduced to 2.5Gb of data from 5Gb, and maintain the AUP limitations. I wonder how much they can take from us because this will seriously make people consider changing to Boost with 3Gb, no restrictive AUP, no data-speed limits on 3G although slightly more expensive at $40/month. 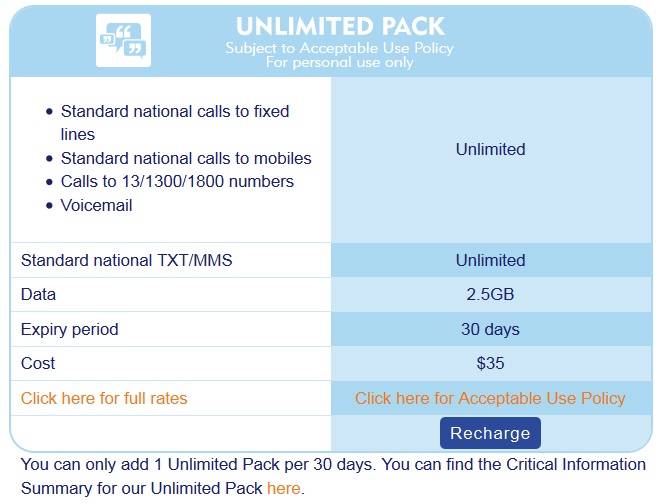 It seems that Telstra may be doing almost anything within its power to limit the surge of popularity of MVNOs using their network – after all, Boost Mobile is owned by Telstra, and are the only other guys I’m aware of using their network. Or maybe, as I predicted, the wholesale agreement between Aldi and Telstra was not as favourable as they may have wanted us to believe, and that price rises (or in this case, service level reductions) would be inevitable. This entry was posted in Telecommunications and tagged mvno. Bookmark the permalink.